In this month’s installment of Beyond the Forecast, I’ll be taking a look at a time honoured cold season tradition in Maine: Nor’easters, The beautiful behemoths that roll up from the Carolinas and rumble by just off our shores. They bring heavy snow, high winds, and sometimes (as we found out on the 24th of January — photo below) rain, sleet, or ice depending on the situation. There is no formal meteorological definition of a Nor’easter though it is generally regarded to be a system that develops off the East Coast and tracks NE while bringing NE winds to the New England coastline. The most famous impact of Nor’easters is, of course, the heavy snow. Nor’easters are such good snowfall producers mainly because they can simultaneously tap into Arctic cold and tropical moisture. The collision of the two, often right overhead, results in the heavy snow Nor’easters are known for. There are a plethora of cool dynamics that occur in these collisions but those are a topic for a future column in slightly more advanced atmospheric dynamics. With northeast winds often come heavy seas and a pile up of water along the coast. While this is certainly more of an issue in an E/SE wind situation, residents of Portland can probably remember a few cases where parts of Marginal Way or Commercial Street were impacted by Nor’easter driven coastal flooding. The other iconic Nor’easter impact is, of course, the northeast winds which whip snow into mighty drifts and drive sheets of rain or sleet into windows near the coast. These winds are caused by differences in pressure between intense low pressure offshore and high pressure to the NW. Air from the high pressure rushes to fill the void left by air rising in the low pressure system. 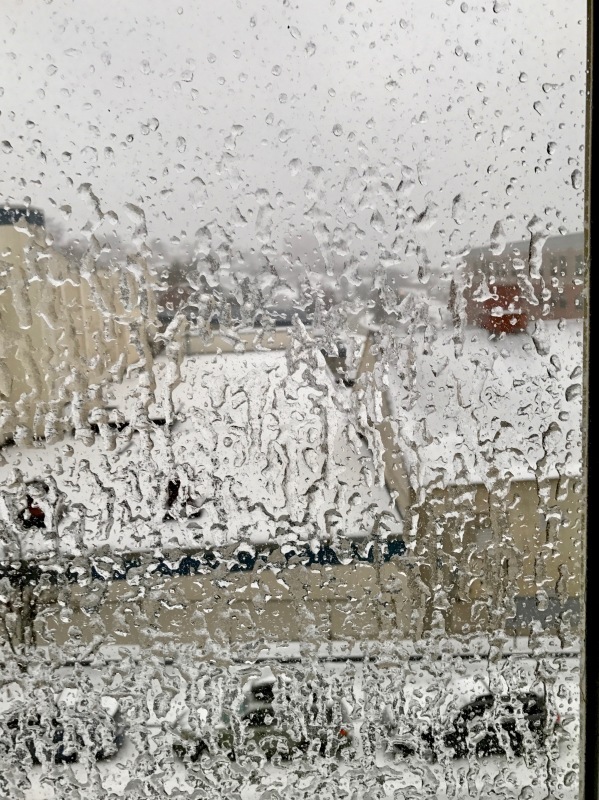 While most Nor’easter winds are too mellow to cause significant damage, they are occasionally responsible for downed trees and power outages, especially when the winds are accompanied by freezing rain. What do you need for a Nor’easter to form? 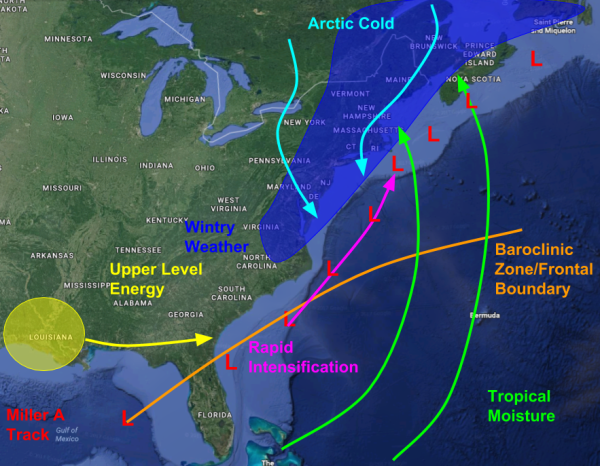 There are two basic ingredients: a baroclinic zone or old frontal system draped across the mid-Atlantic coastline and upper level energy racing across the plains. If the energy hits the front at just the right angle/speed, it will form a storm that intensifies and tracks NE towards Nantucket. If you are a regular reader of my day-to-day blog forecasterjack.com you’ll know that we want the energy to be oriented along a NW-SE axis (negatively sloped). There are other factors to consider, too, like orientation of surface features (highs to the NW are better than highs to the SE for example) and characteristics of the jet stream way up in the atmosphere but the negatively tilted trough in the mid levels is arguably the most important feature to have for a strong Nor’easter. There are two basic types of Nor’easters: Miller A and Miller B. Miller A storms form deep in the Gulf of Mexico and travel NE as they rapidly intensify until they’re right off Cape Cod at which point they turn ENE and begin to weaken. Miller A storms are “pure” or “classic” Nor’easters and happen fairly rarely. 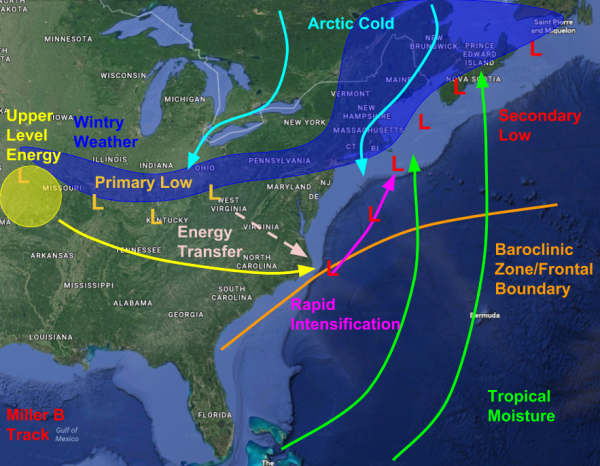 Most of our Winter storms are Miller B events where a storm will travel across the plains states before transferring its energy across the Appalachian mountains to a new system forming over the Outer Banks. These systems usually move NE towards Cape Cod while developing but usually don’t bring wintry impacts as far down the mid-Atlantic coastline as Miller A storms do. How do Miller A/B storms impact Maine? the answer is that for some areas, they’re more or less the same and for others they can be quite different. Along the southern coastline, Miller A storms are more likely to feature mixes of rain/snow/sleet rather than just all snow. They’re often better for the ski areas as more moisture can make it up into the mountains due to the typical track being more towards the NNE compared to Miller B storms which typically track more ENE. If you’re looking for snow here in the Portland area, root for the Miller B’s as they often tend to keep the colder air in place farther south. In the foothills, especially the southern and western ones, impacts from both types of systems are fairly similar. Rarely does a real life storm fit perfectly into either of these theoretical molds but they can provide a rough classification of many big snow events here in Maine. In case you were wondering, the ‘Miller’ in Miller A/B is credit being given to James E. Miller who was a prominent researcher in the area of meteorology in the years following WWII. Miller’s research focused on mid/upper level dynamics associated with mid latitude storms (Nor’easters) and pioneered areas of study such as frontogenesis and vertical velocities which, if you’ve read some of my Winter storm forecasts, you’ll know are crucial to pinpointing the type and intensity of precipitation. I wasn’t able to find a ton of information on Miller’s background, but if you know of any, send me a note and let me know! Positively tilted trough: A positively tilted trough is one that is oriented from NE to SW. It gets it’s name from its slope as related to an x,y coordinate plane (throwback to Algebra!). Imagine constructing a coordinate plane over an upper air map with the trough axis marked. Set the y axis to be oriented N-S and the x axis W-E. If the resulting slope of the trough axis is positive (y values increase as x values do) than you have a positively tilted trough. Positively tilted troughs are not conducive to big snows here in Portland because the winds out ahead of them (over the location of the surface storm) blow from WSW to ENE. This pushes the storm ENE and out to sea. Negatively tilted troughs are the opposite. They are oriented NW to SE and have a negative slope when overlaid onto a coordinate plane. The winds ahead of the trough blow either S-N or SE-NW which pulls the surface storm in closer to the coast resulting often in big snow storms for Portland. For a trough to “go negative”, disturbances in the upper levels must collide and interact at exactly the right time and in exactly the right way. That’s why big snows only happen so often! Lots needs to go right! Dendritic Growth Zone: The area in the atmosphere where dendrites (snowflakes) form. What happens in this zone (temperature, wind, humidity, etc.) will determine if we have light fluffy snow that piles up quickly or if we’re stuck with that sludge that sticks to everything and weighs a ton. The DGZ is usually located wherever temps are between -12 and -18 celsius though sometimes snowflakes can form at warmer or colder temps. For maximum snowflake production, the DGZ must be deep (lots of air that’s between -12 and -18 C), it must contain air that’s rising, preferably rising quite quickly, and also must be saturated with a relative humidity of over 85%. Sounding: A sounding is a tool used by forecasters to analyse the atmosphere vertically from a single point on the ground all the way up to the stratosphere. Soundings can tell you where the air is stable, where it’s unstable, where warm and cold layers are, the depth and saturation of the DGZ and lots more. I’ll probably do a full column on sounding meteorology as we get closer to severe storm season.